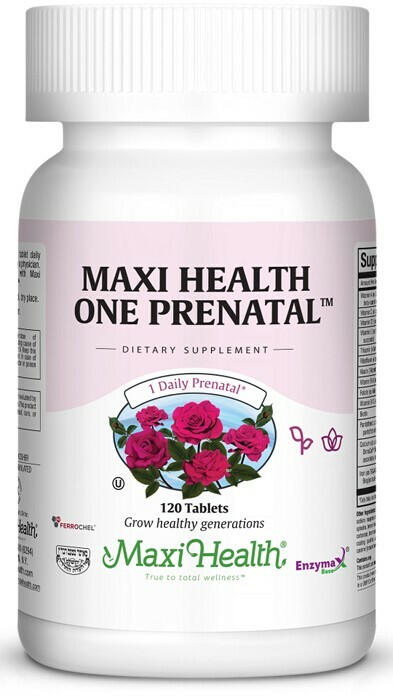 We at Maxi-Health Research have engineered Maxi Health One Prenatal™ to ensure your health and energy, and the health of your fetus. This comprehensive supplement will provide you with the essential nutrients you need. 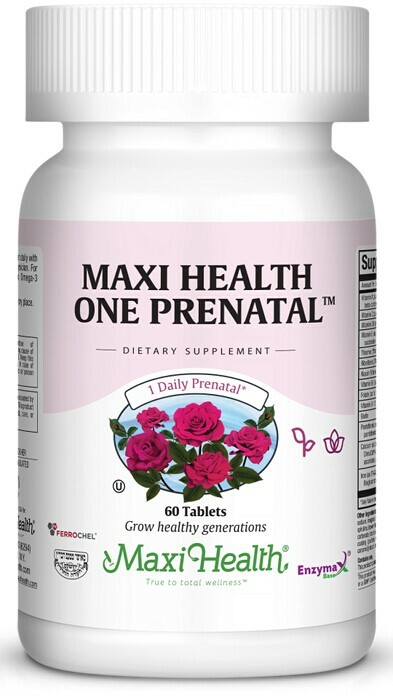 The Maxi Health One Prenatal difference is amino acid chelates which are minerals and trace elements with maximum bioavailability, tolerability and safety. We use only the finest from Albion Labs formulated to survive the gastro-intestinal system, and protect the sensitive mucosal membranes of the stomach and intestines from irritation! Vitamin C supports blood vessels, capillary, and vein strength and helps support a healthy immune system. Iron (as Ferrochel) is a patented, nutritionally functional amino acid chelate form of iron. Magnesium (magnesium citrate) a natural source of magnesium, provides the body with additional magnesium as well as a non-irritating stool softener much needed during pregnancy. Inositol provides the nutrient necessary to make cellular membranes. Take one (1) tablet daily with meal, or as directed by a physician. Other Ingredients: Microcrystalline cellulose, stearic acid, croscarmellose sodium, magnesium stearate, Maxi Green Supreme™ (barley grass juice, spirulina, brown rice bran, broccoli, spinach), Enzymax™ (calcium carbonate, bromelain, papain, lipase, amylase, protease, silica), aqueous ﬁlm coating (puriﬁed water, hydroxypropyl methylcellulose, titanium dioxide, caramel [natural brown color], vegetable glycerin). This product contains NO soy, wheat, salt, gluten, milk, artiﬁcial ﬂavors or colorings. Betain™ and D. Salina™ are registered trademarks of Cognis Nutrition & Health. Bioperine™ is a patented product from Sabinsa Corporation. CaroCare™ is a registered trademark of DSM, Holland. Enzymax™, a vital digestive enzyme complex, is a registered trademark of Maxi Health Research™ LLC. Maxi Green Supreme™ is a trademark of Maxi Health Research™ LLC. Selenium SeLECT™ is a registered trademark of Sabinsa Corp. I chose this multi because the ingredients seemed high quality & it also contains some supplementation of vegetables. I only had to take one per day, did not cause any upset stomach. It was great for me as I had nausea for the whole 1st trimester! This vitamin was just what my baby needed!